Choose your own Personal Toll Free Number with on-line signup - True 800 Numbers! UNLIMITED FREE calls and texting! 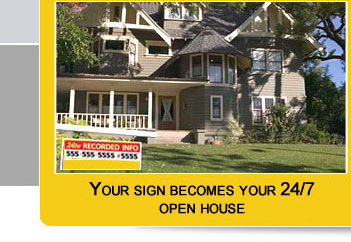 Everything is included, no hidden fees, your sign becomes your 24/7 Open House! 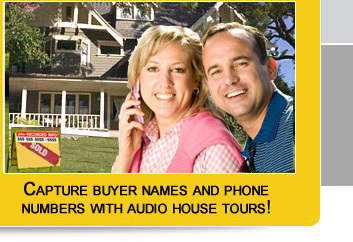 property description - audio tour. Testimonials . . . we know that job security only comes from satisfied customers! I just sent you a referral. Using economical technology to produce more sales is an absolute no-brainer. Beth K., Vero Beach, FL Thanks for the live response on your customer service line. You answered my question and it sounds perfect for us. Michael F., Pine Valley, CA Now when we get the text messages with the caller's ID, we can contact potential buyers while they are still in front of the house. READ WHAT A BEST-SELLING AUTHOR HAD TO SAY! This is still one of my favorite marketing tools for capturing leads. 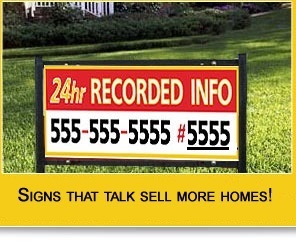 I get up to a 300% higher response rate with my advertising using a call-capture 1-800 hotline. This is a fairly easy system to set up. After they get you set up with your own 1-800 number, you simply call into your hotline system and record information about your property right over the phone. You will be given ID numbers to use in all of your various advertising. Then, to be able to track which media or advertising outlet the buyer prospect used to find your 1-800 number, you will add another number. 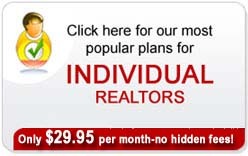 Many of the hotline systems available are specifically set up for real estate and mortgage professionals. You can try www.HotlineAmerica.com. There is no long term contract or sign-up fee. The cost includes all the toll free calls you receive. That is a pretty good deal. Excerpted from: Home Selling Mastery: Master The Art Of Selling Your Home Fast And For Top Dollar Without A Realtor For Maximum Profit - A Complete Easy To Read Homeowners Guide For Selling By Owner, by Gary Marshall (Kindle Locations 969-975).